Tinker's Creek—the Cuyahoga River's largest tributary—is named after Joseph Tinker, the principal boatman for Moses Cleaveland's survey crew. The steepness and rockiness of the Tinker's Creek gorge made much of the land along the creek bed inaccessible for homes and farming, allowing the area to remain in its natural state. 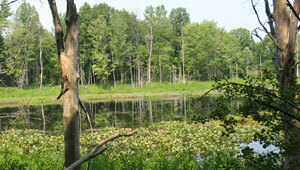 In May 2011, The Trust for Public Land purchased 137 acres in the creek's headwaters from the Elsie M. Ten Broeck Revocable Trust and conveyed it to Metro Parks, Serving Summit County for a new natural area. The sale marks the conclusion of a 68-year legacy of land acquisition and preservation started by the Ten Broeck family, who had a deep love for nature. Together with the land added to Aurora's Liberty Park TPL has helped conserve over 1,700 acres in the Tinker's Creek watershed.